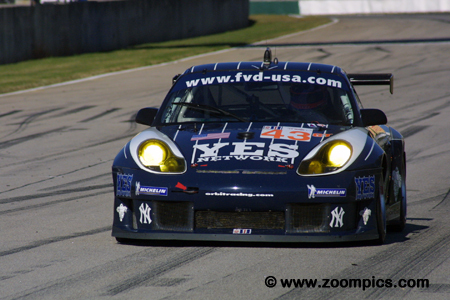 2003 was the fifth season for the American Le Mans Series. The rules for the series followed those of the legendary 24 Hour of Le Mans which meant there were four classes. Le Mans Prototype 900 (LMP900) – These were the purpose built race cars powered by a 6.0-liter normally aspirated or 4.0-litre turbocharged engine. The vehicles could weigh no less than 900-kilograms. Audi supported two teams. 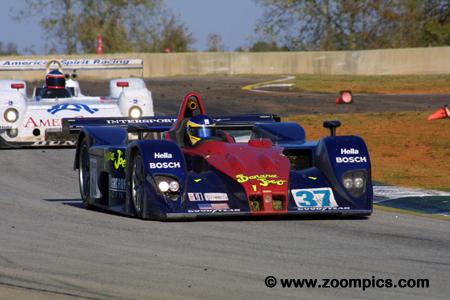 Privateers entered cars manufactured by Riley & Scott, Lola, Dallara and Panoz. Le Mans Prototype 675 (LMP675) – Introduced in 2001 was the LMP675 class for cars that could weigh no less than 675-kilograms. The rules for the vehicles were written so that the two LMP classes (LMP900 and LMP675) would contend for the overall win. Grand Touring Sport (GTS) – This class included production-based cars such as the Dodge Viper GTS-R, Chevrolet Corvette C5-R, Saleen S7-R and Ferrari 550 Maranello. The vehicles were permitted to use 8.0-litre normally aspirated or 4.0-litre turbocharged engines. These cars could weigh no less than 1,100-kilograms. Grand Touring (GT) – The GT cars were also restricted to a 1,100-kilogram weight rule. This category also included production-based vehicles. Competitors raced cars such as the BMW M3, Porsche GT3RS and Ferrari 360 Modena. Unlike the GTS entries, teams in this category could not use carbon fiber brakes. 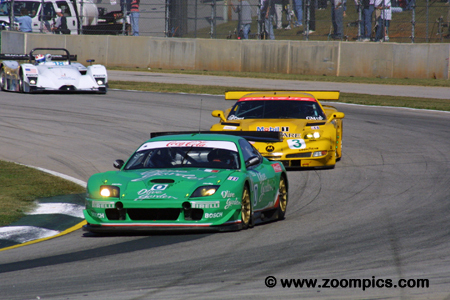 The ALMS schedule included nine North American events in 2003. The opening round was the 12 Hours of Sebring. 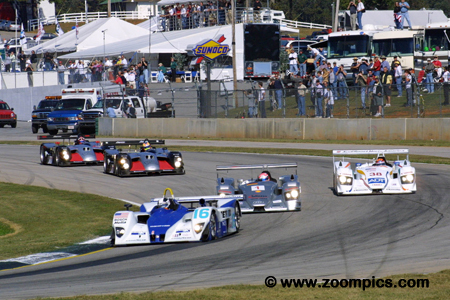 It was followed by the first of two races at Road Atlanta, Sonoma and the series second visit to Trois Rivieres. The second Canadian event was held at Mosport, next up was Road America, then Mazda Raceway Laguna Seca and the Miami street circuit. 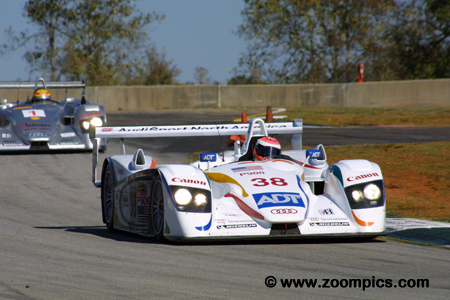 The final race of the 2003 American Le Mans Series season was Petit Le Mans at Road Atlanta. This event would determine many driving, team and manufacturer titles. It was also a qualifying event for the 2004 running of the 24 Hours of Le Mans, with the class winners receiving automatic invitations to compete in the French classic. The race was designed to be a smaller version of the 24 Hours of Le Mans. The race length was set at 1,000-miles or 10-hours. In the four previous runnings, the 1,000-mile mark had been reached by the race winners before the 10-hour maximum time limit. Leading the Grand Touring field is the Grand Touring Sport pole-sitting Ferrari shared by Jan Magnussen, Anthony Davidson and David Brabham. In second, is No. 88 Prodrive car which qualified third in class. The Ferraris are followed by the fourth fastest qualifier, the No. 4 Chevrolet Corvette and the Olive Garden Ferrari which started on the outside of the Grand Touring Sport front row. On the last lap of qualifying, James Weaver moved from third overall to second and in the process captured the LMP675 pole-position. Sharing the No. 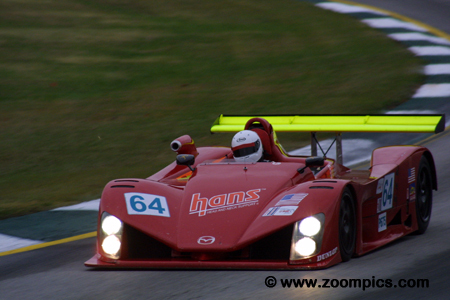 16 Dyson Racing Lola EX257 with Weaver were Andy Wallace and Butch Leitzinger. Weaver led the class but was forced to pit on lap-5 with electrical issues. The crew made repairs but the car caught fire leaving the pit-lane. The damage was too severe for the car to continue. 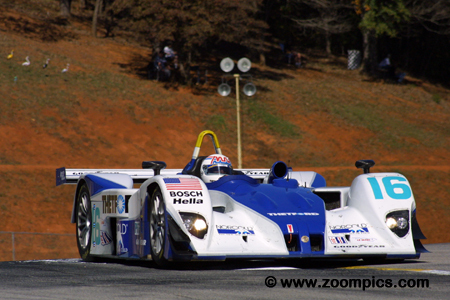 J.J. Lehto and Johnny Herbert captured the season’s first race at Road Atlanta and entered Petit Le Mans having won the previous round at Miami. They would need this momentum as Lehto trailed Joest teammates, Frank Biela and Marco Werner in the title chase. Lehto qualified second in LMP900 and would share the driving with Johnny Herbert. The pair led every lap of the race and won by eight laps. The event did not start very well for the No. 88 Prodrive Ferrari 550. During the first practice session, Tomas Enge had an accident in turn twelve which resulted in extensive front end damage. Enge drove the car in qualifying and traded fastest times with the Prodrive Ferrari of David Brabham. When the session concluded he was third quickest. The race was a showdown between the two Ferraris with the No. 88 getting the victory. 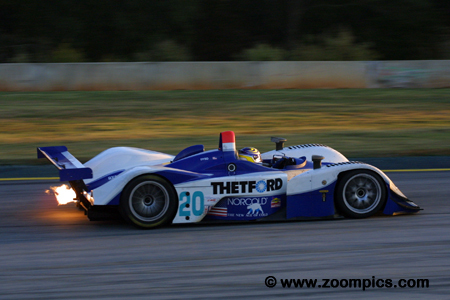 Intersport Racing appeared to be the team to beat in the LMP675 class. 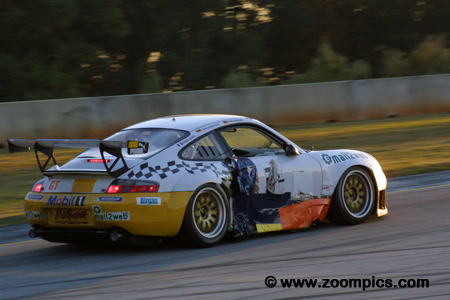 They won the category at last year’s event and also took the victory at Road Atlanta in June. Sharing the Lola EX257 were Jon Field, Duncan Dayton and Larry Connor. Field qualified the Lola third in class and seventh overall. The team inherited first place when Chad Block had an accident in the Dyson entry. Despite overheating issues the Intersport group won. LMP675 point’s leader, Chris Dyson, shared the No. 20 Lola EX257 with Chad Block and Didier de Radigues. Dyson could secure the championship if he completed 70-percent of the race. De Radigues held the pole early in the qualifying session but was bumped to second by James Weaver. The team took the lead when Weaver retired but an error by Block and a series of issues left them in second place at the finish. The GT title was decided before the season finale but third place was still up for grabs. 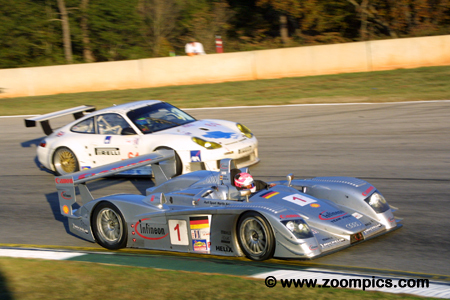 With a good finish at Petit Le Mans, teammates Jorg Bergmeister and Timo Bernhard could secure the position. 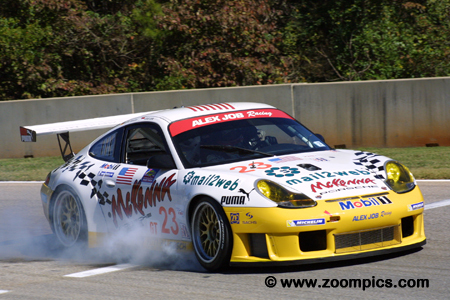 Joining them in the Alex Job Racing Porsche was Romain Dumas. Bernhard was second quickest in the qualifying session. Just 25-minutes into the race a GTS Ferrari made contact with the passenger door but the team recovered and won their class. 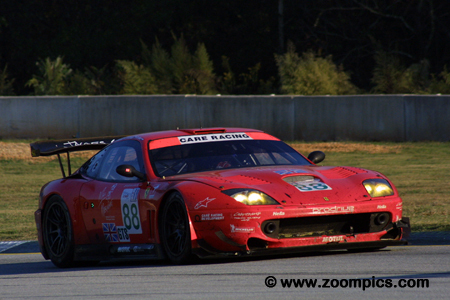 By the season finale at Petit Le Mans, Alex Job Racing teammates Sascha Maassen and Lucas Luhr had wrapped up the Grand Touring title. Maassen handled the qualifying duties and was the quickest GT car. Unfortunately, both drivers were under the weather and the ten-hour race would be a challenge. The pair was second in the final hour and closed on the teammates in the No. 24 but were 26.371-seconds behind at the finish. The No. 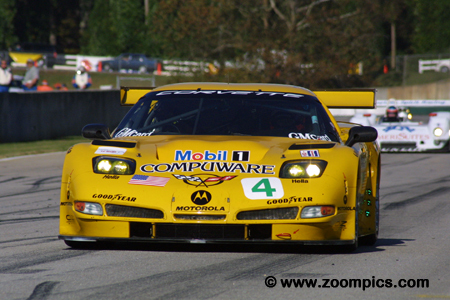 4 Chevrolet Corvette C5-R was shared by Oliver Gavin, Kelly Collins and Andy Pilgrim. Their teammates, Ron Fellows and Johnny O’Connell had already wrapped up the GTS championship. 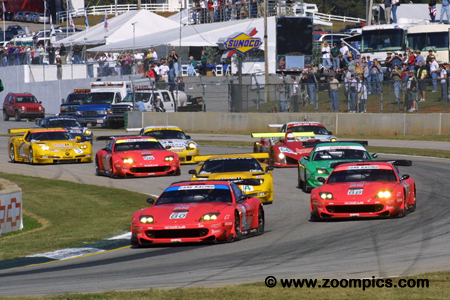 Early in the race, the Corvettes and two of the Prodrive Ferraris fought for the class lead. However, the Corvettes were plagued with a number of problems. The No. 4 car finished third in class - nine laps behind the Ferraris. 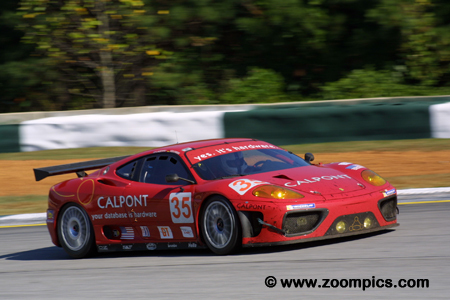 Risi Competizione entered a Ferrari 360 Modena for Anthony Lazzaro and Ralf Kelleners. They started eighth in Grand Touring and twenty-sixth overall. By the second hour of the event, they were fighting with the class leaders. However, they proved to be no match for the Alex Job Porsches and finished five laps behind them – third in Grand Touring and thirteenth overall. 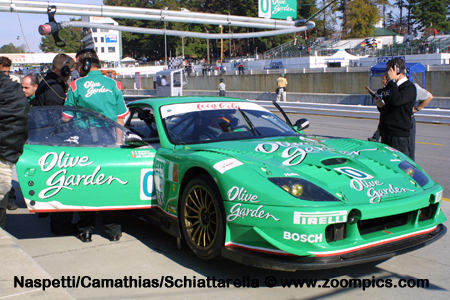 For Petit Le Mans, Team Olive Garden regulars, Mimmo Schiattarella and Emanuele Naspetti were joined by rookie CART driver, Joel Camathias. The Prodrive Ferraris were dominating qualifying but on last lap of the session, Naspetti grabbed second in the GTS class. Unfortunately, Naspetti spun early in the race and made contact with the No. 24 Alex Job Porsche. The damage to the Ferrari was extensive and the team retired. Second fastest qualifier, James Weaver in the No. 16 Dyson Lola takes the lead entering corner one. However, officials informed Weaver that he had jumped the start and he should allow the pole-sitter, Marco Werner to move back in front of him. He slowed down heading into turn twelve and was passed by the Audi R8s of J.J. Lehto and Werner. David Brabham had won the last three GTS races and for Petit Le Mans he was joined by Jan Magnussen and Anthony Davidson. Brabham performed the qualifying honours and put the Prodrive Ferrari on the class pole. When the Corvettes fell out of contention, the GTS class win would be decided between the No. 80 and 88 Ferraris. After the final rounds of pit-stops, Brabham was second and closed within 1.053-seconds of the winner, Tomas Enge. Veteran sports car campaigner, Jim Downing, entered the Mazda-powered WR LMP02 for himself and co-drivers Howard Katz and Yojiro Terada. The car started eleventh overall and fourth in LMP675. The trio ran as high as second in class but at the checkered flag were third in their category and twenty-second overall. Team Joest's Frank Biela and Marco Werner enter the season’s final event with a 14-point lead over Champion Racing's J.J. Lehto. Werner got their title hopes off to a good start by securing the LMP900 pole position. A finish of sixth or better would give the pair the championship. Biela was second on lap-63 when he swerved to miss a slower car and hit the wall in the ‘Esses.’ The team was able to make repairs and the duo finished third. Joining series regulars, Peter Baron and Leo Hindery in the season’s final event was Porsche Junior driver, Mike Rockenfeller. A strong qualifying effort by Rockenfeller put the No. 43 Orbit Racing Porsche GT3RS third on the Grand Touring grid. During the race, they were able to keep pace with the two Alex Job Porsches but a transmission issue caused them to retire on lap-313. They were classified tenth in GT and twenty-third overall.